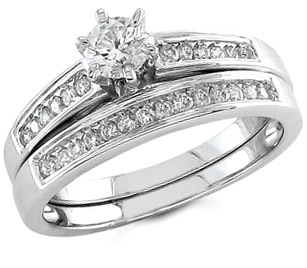 Diamond Bridal Set Engagement Ring and Wedding Band set in high quality, 14k white gold with a total diamond carat weight of 0.55 carats (over 1/2 carat). Center stone is 0.25 carats with 0.30 carats total weight of side diamonds. Apples of Gold Jewelry guarantees the 1/2 Carat Diamond Bridal Set Rings to be of high quality and an authentic engagement ring with real diamonds, as described above.